In order to eliminate publication bias and ensure high quality of published papers, all eligible manuscripts received will be submitted to a double-blind peer review process. Manuscripts are reviewed initially by the Editors, who acknowledge the receipt of the manuscript and act as a first stage filter, within a week of receipt. A fully anonymised version of those manuscripts which meet the scientific and editorial standards, fit within the aims and scope of ESP Today and observe its general guidelines is sent for outside formal review. Each manuscript is reviewed by two referees who are specialists in the field. 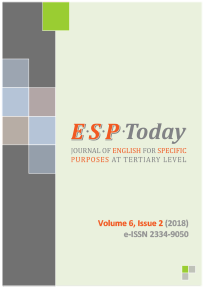 ESP Today possesses its own reviewers’ database. However, authors may suggest potential reviewers. Referees are provided with assessment instructions and a manuscript review form. The quality of reviewers’ reports is carefully controlled by the Editors. Referees normally respond within up to 4-6 weeks and an editorial decision as to whether to accept the paper for publication, reject it, or ask the author for a minor/major revision is made as soon as both referees' reports are received. The Editor's decision is then sent to the author together with recommendations made by the referees. Authors may be asked to return their revised manuscript to the referees, after which another revision might be asked. If a consensus is not reached between the reviewers on the quality of the submitted paper (accept/reject), a third opinion may be sought. A proof of the final version of the paper will be sent to the author for correction, and should be returned to ESP Today by the set deadline.